Okay. Time to get a little self-indulgent up in here. A while ago I took part in a Coursera course called Writing II: Rhetorical Composing. The very first assignment was to write a piece describing your identity as a writer. Not to let any writing go to waste, I’m posting it here. Enjoy! Some might think my current career as a writer was inevitable. My mother, while not a professional, wrote or read in every spare moment she had. Many a night she could be found in her study, clicking away on her computer, filling it with stories and poetry. 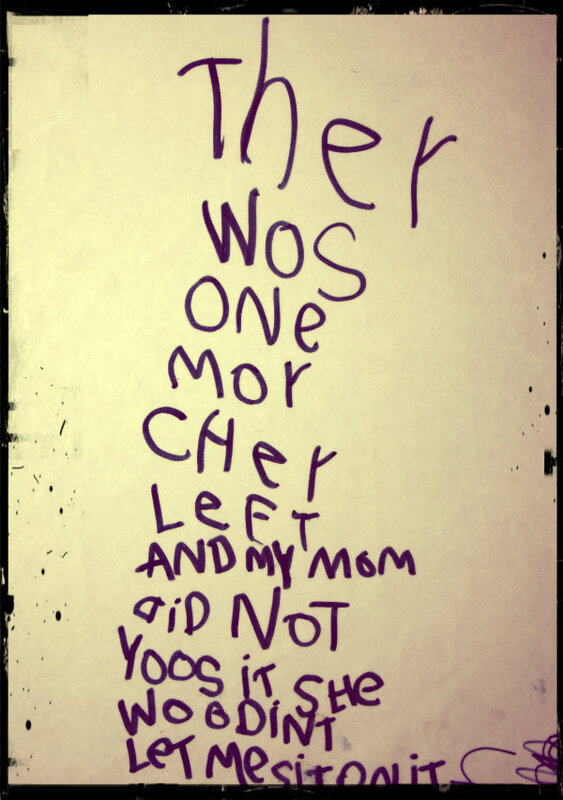 My sister, similarly, read voraciously, and would often retire to her bedroom as a teenager, with a pen and notepad, while I was still paging through picture books, ignoring the text. They passed this love of the written word to me. I clearly remember the day my sister suggested I start reading Archie comics, to ease myself into it. Those comics were, in fact, the basis for most of my early vocabulary. 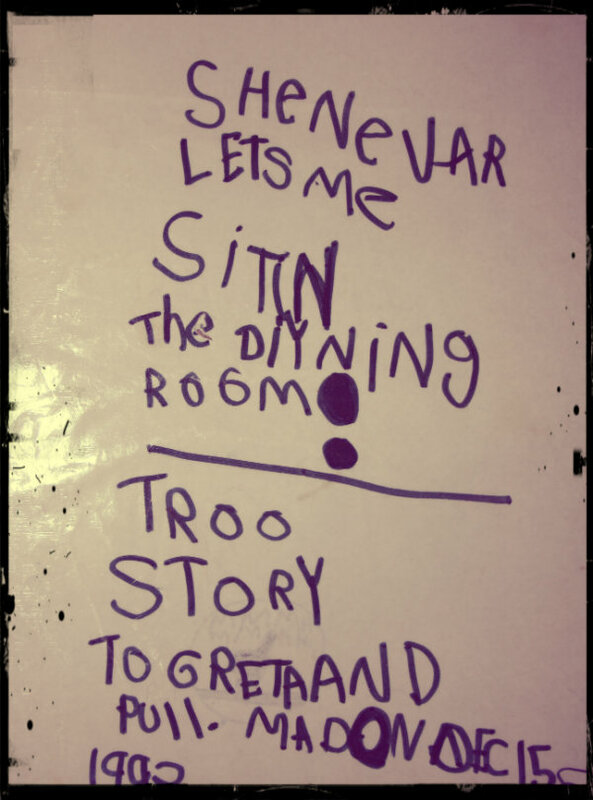 One evening, when I was six, I tried my hand at writing. 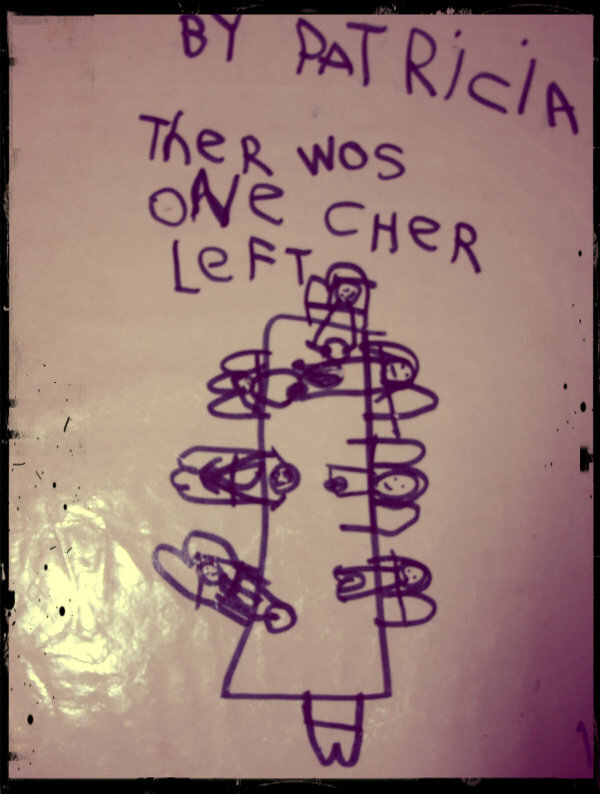 My magnum opus, Ther Wos One Cher Left, led to many well-meaning giggles and is still a family joke. It currently sits, laminated, in my mother’s study. The three page book had been penned in a fit of spite after my parents, in the midst of a dinner party, told me there was no space in the dining room, in order to keep me away from the grown-up revelry. As is obvious from the title of the story, I saw through their excuse. The book earned me a spot at the table for dessert. Everywhere I looked, omens of my impending writerhood appeared. My left handedness (“Ooh, lefties are creative”). My high marks in English and Afrikaans (“She has a talent for languages”). My introversion. My reading level, which led to my being cast as the narrator in more than one school play. My vocabulary, which led to me once sassing my father by calling him incorrigible. I had been told I’d be a writer for so long, that I, too, believed it was inevitable. Not only that, I believed it would be easy. I began writing juvenile short stories, angsty poetry, essays of opinions recycled from snatches of other people’s conversations. The praise came easily, and it felt good. But praise usually comes easily to a child. My parents, with the best of intentions, gave me a false sense of confidence, believing it to be encouragement. I became somewhat smug, mentally correcting the spelling and grammatical errors in the notes my school friends passed to me in class. I would try to think up the most obscure questions to ask the English teacher, and be filled with delight when they couldn’t answer. Yet, despite this, I decided against studying English. It seemed far more practical to invest my time in a journalism degree. After all, my favourite writers were journalists first. In university, surrounded by the other journalism students, my enthusiasm for writing dwindled. In my internship, it slowed to a trickle. In my post-university career, it all but died away. After enough time spent in the company of better writers, better journalists, and harder workers, the awareness of my own ordinariness was no longer avoidable. I was an adult. I was mediocre. Things didn’t come easily, and it stung. Sometime after that, writing lost its charm. My love of words became work. The thesaurus in my head became ever limited as it was only used in corporate copy, or used to neutralise the superfluous adjectives in fluffy press releases. I became drawn to proofreading and sub-editing, feeling like that’s where my true talents lay. Picking apart the writings of other people, never needing any creative thought myself. Even that became detestable after a while. The repetition of it all was mind-numbing, like I was the member of a magazine chain gang. Putting the same old words in the same old stories, correcting the same consistent mistakes. Eventually, my only relationship with fiction became snatched moments before bed when I could keep my eyes open long enough to read a few pages of a novel. Words made me weary, better writers made me envious, and frenzied typing causes carpal tunnel syndrome anyway. I knew I had to find my way back to writing. I had to overcome my self-pity, and make peace with the fact that I wasn’t the best. I will probably never be the best, but I could get a hell of a lot better if I worked hard. I began listening, again, to the music of words. Jotting down any pretty things I read, or that popped into my head, compiling a mishmash of nonsensical poetry. Bit by bit, I found my passion again. It felt like my words had meaning, rather than filling a page with meaningless jargon. My stiff fingers again settled into the rhythm of fiction. Peppering pages with barely relevant analogies, describing moments in the most ludicrously flowery polysyllabic adjectives. Writing unfinished stories I’m still too ashamed to let anyone read. I rediscovered writing, not because I’m good at it. Not because it’s in my blood. But because I love it, and always will.